As much as I fell under the spell of HMHB's 1985 debut LP 'Back In The DHSS' I had a fear that any follow-up would prove to be near- unlistenable. 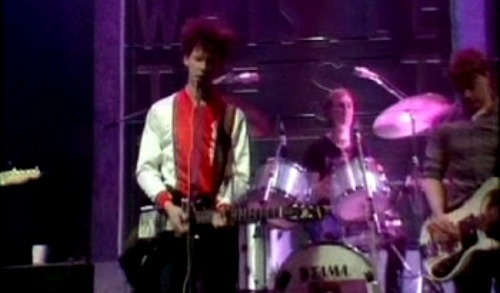 While the main attraction of the first set of songs had been the lyrical mix of satirical humour, pathos, biting social commentary and clever digs at popular culture, much of its appeal lay in its basic and true punk rock nature with the musicians sounding as if they had only first picked up their instruments on the day of recording. But in all honesty, there's only so much of that anyone's ears can truly take. So it was a real surprise and joy to see the band on the telly one evening delivering a solid and professional performance of two brand new songs on Whistle Test on BBC 2 in May 1986. I've since learned, via t'internet, that this remains just one of two appearances HMHB has ever made on telly and so it was a privilege not just to see it but record it to a VHS tape which I still have in a box somewhere. 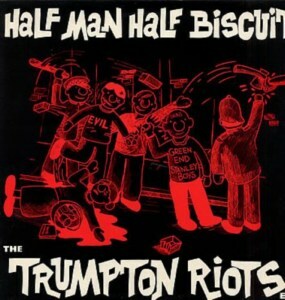 The new record, 'Trumpton Riots EP' was duly bought on 12" vinyl the next day; it cost me £2.79 from the Virgin Megastore in Glasgow (the price label is still on the sleeve). It was on Probe Plus Records but was given a one-off catalogue number - TRUMP 1. Honestly! 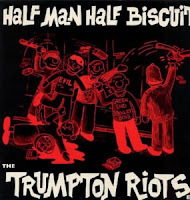 All four of its songs remain among my all-time favourite HMHB efforts; the EP was re-released later with a new cat no. of TRUMPX 1 with a fifth, equally brilliant song added. All of them I'm sure will be part of this fantastic series at some point - indeed some may have already featured by the time this is shared with you - but I'm homing in on Side B, Track 1 - 1966 And All That. while the chorus goes on to name-check some of that same era's finest cult footballers such as Lev Yashin and Ferenc Puskas. Utter genius. Phenomenal lyrics. In a just world, they would be hailed as songwriting geniuses. Sorry to hear you're a Raith Rovers fan. Still a chance to overtake The Pars before season's end though. According to the site stats, this is the second most-read article ever on this blog! Anyone seen it mentioned somewhere?